WHEN IS A CLASS, NOT JUST A CLASS? WHEN IT’S SMALL GROUP TRAINING. 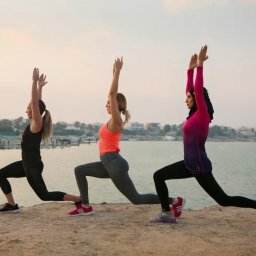 Home Capital Fitness News WHEN IS A CLASS, NOT JUST A CLASS? WHEN IT’S SMALL GROUP TRAINING. Here at Capital Fitness, we pride ourselves on high quality, individually tailored personal training, expertly delivered in our luxury boutique studio. We understand that a lot of our clients want to train with their friends, family or within a group environment. Training alongside others can be a lot of fun and can really ramp up the motivation, as well as adding a little of that competitive spirit. We offer 2 solutions – Buddy Training and Small Group Training. Buddy Training is a fantastic and popular product that allows two clients to train with a single personal trainer. The journey, as always, starts with a complimentary client consultation, and from there you’re provided with an individually tailored exercise and nutrition program. You’ll then start training with both partner-based and independent training techniques. Both ‘buddies’ achieve their desired results together, getting all the expert periodised programming and full trainer attention they would expect from our private personal training sessions. As with our 1:1 personal training packages both ‘buddies’ get full independent use of the Capital Fitness facility for the duration of your membership, as well as the Capital Fitness results tracking app. Buddy Training is available in the main studio area, outside in our multi-use garden and in our exclusive, private VIP rooms. All this, at just over half the price of our Individual Personal Training Packages! Call now for a complimentary tour and consultation! Small Group Training is the next step in group training. Training within a group or class setting has huge appeal to many, but often, in our experience, as the class numbers grow, the care and quality of instruction drops, along with the client’s results (and the injury risk starts to jump). If you are training alongside 20 or 30 other participants how can your trainer ever hope to keep track of you? You simply become a number. Nobody is keeping track of your technique, your intensity, your progress. The class itself has to become more and more generic in an attempt to keep everyone satisfied and generic programs lead to worse results. The Capital Fitness answer to these problems is Small Group Training. Each session has a maximum of 6 participants. That’s you and only 5 others, maximum. This number is small enough to allow the trainer to give maximum attention, whilst big enough to give the camaraderie and motivation you would associate with a class. Our classes are designed differently to those that you may find in other facilities – they match our evidence-based training methodologies and are designed to elicit optimum results, whilst teaching clients to train safely and effectively. Small Group Training sessions also use the whole Capital Fitness facility and take part in the main studio as well as outside in our multi-use garden. Interested? Call or message us to book your class now. First class is free, limited availability.